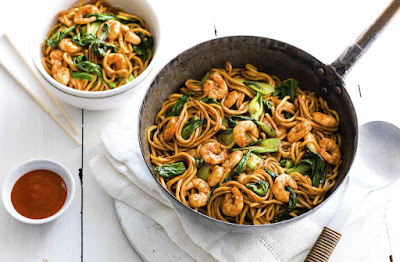 Have dinner ready in minutes with this easy prawn stir-fry recipe. A squeeze of chilli sauce gives it a deliciously hot kick, while crunchy pak choi and silky egg noodles add texture and depth. Heat the oil over a high heat in a wok or large frying pan. Add the prawns and pak choi, stir continuously for 3 mins, or until the prawns have turned pink and the pak choi has begun to wilt. Add the soy sauce and Sriracha sauce along with the noodles, toss to coat in the sauce, then stir fry for a further 3-5 mins or until the noodles are piping hot. Serve immediately with extra Sriracha sauce, if you like.